If you've seen Wes Anderson's films then you've seen the artwork of his illustrator brother, Eric Chase Anderson. 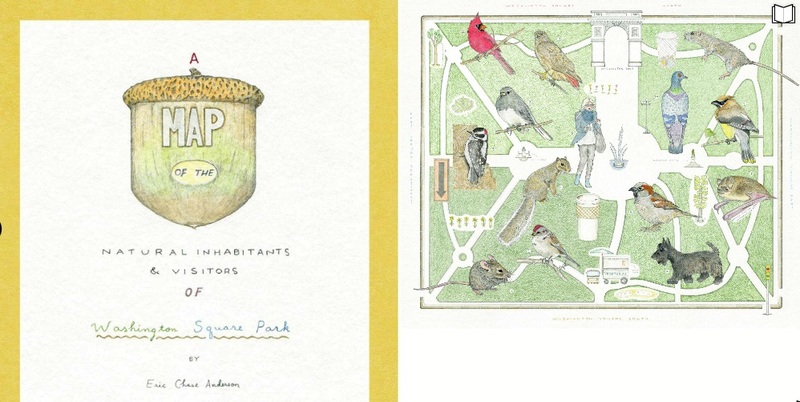 Eric Anderson developed a Map of the Natural Inhabitants & Visitors of Washington Square Park for the NYU Alumni Magazine. The map is an insert in Issue #23. You can view the map online (scroll to the last page then flip inward two pages). Issue #23 is also embedded at the end of this post. One of my favorite features of the map is the proper collective noun or grouping name for most of the animals on the list. Here's an example: An earful or museum of dark-eyed juncos.